How have I not linked to The Small Object’s Wedding Toppers before? They’re always among my very favorite things, but the latest round really made me smile. Loving Marcel the Shell with Shoes On. So charming. Did you see my redesign of Pancakes & French Fries? I love the header photo we went with. Wow. I want a crazy cool headboard for Eleanor’s new room. I have a cute pink suitcase, but I would happily trade up for one of these by Liberty of London. Or you know, my dream luggage: the Editor Series. Don’t you just love classic airmail stripes? She’s Got the Magic. Totally. My favorite children’s books are listed over at Ohdeedoh. Joy’s new line of wallpaper has launched! And she’s a busy lady; Her new book, Creative, Inc. is out too. Check out the behind-the-scenes of her stop-motion promo trailer. Freak out in a moonage daydream over this vintage space-themed wallpaper. “Facebook: Striking, Miraculous Social Team-Up!” These vintage internet ads a pretty clever. Jaime Oliver’s food packaging is awesome. The simplicity is so refreshing (and cool). Thanks, DWR. Now I’m wanting new black flatware. Viv’s new Aboriginal art is so beautiful. The design*sponge ad team has a new blog “designed to make advertising easier”. It’s super helpful to anyone considering advertising on blogs. Enjoyed this roll very much! Love the redesign of Pancakes and French Fries! You did a great job! The header is fantastic, super cute! 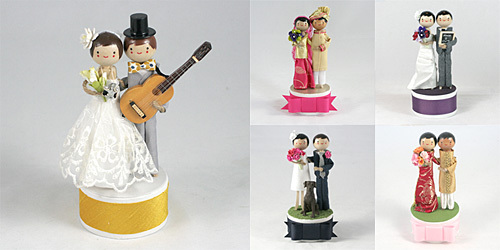 I’m so sad that I didn’t know about those cake toppers (or they weren’t around) when I got married in 2008! We went topper-less because we just couldn’t find anything that was “us,” but those are perfect. Drats! Also, love your use of Buttermilk on Pancakes and French Fries :) Very cute redesign! It became one of my favorite details at our wedding. Oh, gosh. A friend showed me Marcel the other day and I watched it over and over. Adorable. 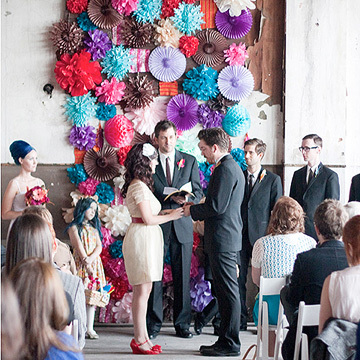 Those wedding cake toppers are adorable! 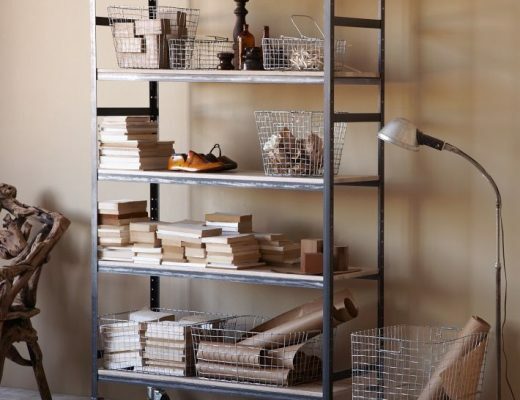 I’m totally with you on the airmail stripe love. It makes me endlessly happy to know a friend or family member will get them in their morning mailbox with every letter I send back home to the states. $135 for a wedding cake topper is ridiculous!! Cute yes but way overpriced.